Are we as a synod ready to make changes for the sake of the gospel? Are we ready to network, collaborate and share ideas? Are we ready to take risks and even fail? Are we ready to equip and empower congregations? The 2015 Assembly answered an enthusiastic “Yes!” to these questions from Forward Together in Faith Chair Ellen S. Daneke, St. Peter, Lafayette Hill. • Equipping our congregations’ lay and rostered leaders for innovative risk-taking to reach out beyond their walls and making the Congregational Assessment Tool (CAT) available to all who want it. • Innovating the birth of new ministries through the Synod and through congregations listening to their neighborhoods. • Communicating our stories more effectively by improving Synod technologies that link congregational leaders and equipping congregations in social media, web and electronic communications. • Networking lay and rostered leaders in new ways, using results of the CAT and by supporting local initiatives to partner with church and community groups. • Initiatives in these areas will take shape as funds are raised toward the campaign’s $2.5 million goal. In addition, funds raised will be tithed toward The Campaign for the ELCA. Equipping. The Synod’s vision reflects the development of the 1st Century church, yet requires 21st Century creativity and imagination, especially in the area of equipping leaders, Kjellberg said. He described the process experienced by more than two dozen congregations so far taking the Congregational Assessment Tool (CAT), which has generated a lot of excitement. With funding from this appeal all congregations that want to will be able to use this tool. Teri Lanan of Trinity, Lansdale said that the CAT helped the congregation’s leaders understand why a capital appeal had stalled and how to readjust. Bishop Burkat said that “with the resources we raise in the next three years we will start a mission school to teach clergy and lay leaders how to take risks and to share successes and failures.” Raising additional scholarships to assist seminarians with education debt is also a top priority. Networking. Equipping leaders, innovative ministries and communicating the gospel are woven together through networks, said Pastor Jim Goodyear from Gloria Dei, Huntingdon Valley. “Networking is a bunch of holy threads together. Often times it looks kind of messy,” he said, but “when you put it all together there is a whole lot of beauty,” he said. 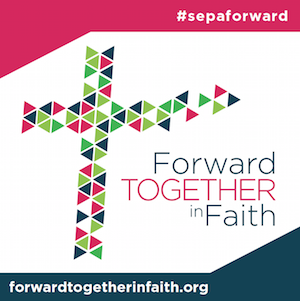 Forward Together in Faith will help the Synod and congregations create and expand networks, and link congregations according to shared passions and challenges. Welcome Church’s Welcome Threads project is both a funding stream and a network that includes artisans among people experiencing homelessness, a local artist and studio, and business students from Johns Hopkins. Resurrection, Yardley, pioneered the Lower Bucks Food Insecurity Alliance with other congregations, civic group and businesses. They do advocacy, prepare 500 breakfast boxes a week for hungry school children, and are committed to being a group of study and prayer. “No matter how big or how small your congregation is, together in partnership you can do more,” says Resurrection’s Diane Casey.